Schroon Lake cabin is privately tucked in the woods AND has deeded right of way 10 ft. wide to the shore of Schroon Lake with the right to maintain a shared dock. 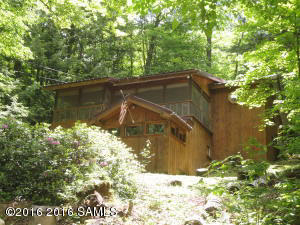 Cabin has 12 X 22.5 ft. screened porch that looks out into the evergreen trees. The living room has a propane fireplace, cathedral ceiling with a ladder to the loft. There are 3 bedrooms, one is actually under the screened in porch, so it's cool all summer long. The original cabin was built in 1926 but the upgrades make if feel young & FUN.